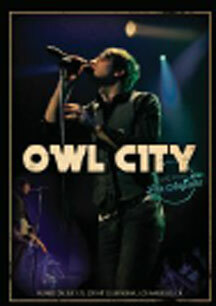 Owl City is the creation of Adam Young, a Minnesota native who started making music at home and building up a fanbase via the internet before breaking worldwide in 2009. This DVD was filmed in high definition at Club Nokia on July 21, 2011, and is the first Blu-ray release by the band. It includes tracks from their recent album "All Things Bright And Beautiful," and more. Also included is behind the scenes and Young interview.